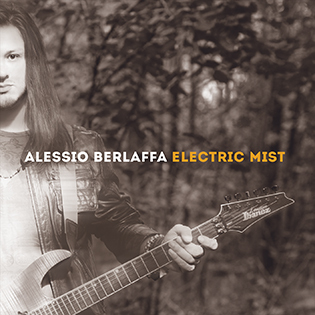 Alessio Berlaffa discusses his new album Electric Mist (Lion Music, 2018) with Andy Carey of Prog Pulse. First of all thank you for this interview! I'm very pleased to let you discover my musical journey! It’s an 11 songs concept album based on the grandeur and majesty of nature where songs are tied together or gently flows into each other. Please describe your album and your music for someone who don't know anything about you! Above my old school shred way of playing, there's something more I think. From classic hard rock sounds to 80’s biting heavy metal, through deep echoed clean ambient guitars to strat vibes with orchestral arrangements, Electric Mist has 70’s progressive rock influences, real Hammond, AOR harmonies and even classical piano sounds: it’s not the typical guitar oriented modern album. Who are your musical influences now and while growing you? All the bands from the 80's before guitar players itselfs, i love more songs than solos. 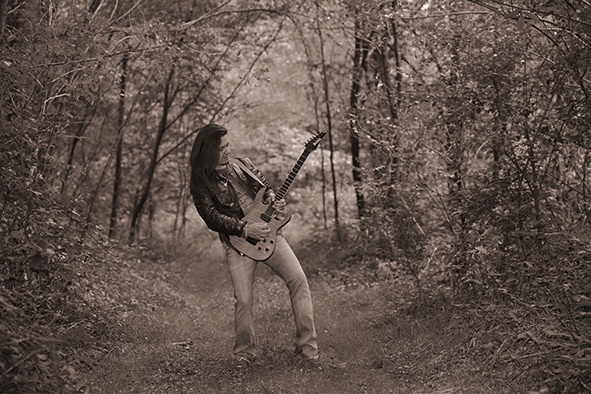 It's funny how for example, I used to love Malmsteen more in the last years than in my youth. I have tons on albums and still have Vinyls and cassettes from my 80's and 90's, so if i have to choose i can say Van Halen then Winger, Dokken, Ozzy, Ratt and so on. Bands like Genesis, Kansas, Yes use to feed my prog sense of harmony when it comes around and i love to listen also to "Americana" type of pop rock or some John Mayer too. I know this is a hard question but anyway:-) If you were forced to say that your album is for fans of "X" - which band would that be? Aiming high (really high!) I can say Van Halen! But for sure fans of Satriani, Timmons, Gilbert, Vai, Malmsteen…80’s era old school guitar heroes. If you are a fan of Tosin Abasi, you won’t find 8 strings here, nor you can find Fusion: you would have real songs to listen to. It's exactly an overture, beacause you can hear most fo the themes in the concept from this intro. The use of the lidyan dominant and pitch axis determines the "floating" experience as getting lost into the mist. It's a big american style tune with many variations on the theme and free solos from the band! I love the main riff because to em, it's reminiscent of a big clear sky. An intricate groove and a melancholy theme leading into an open view chorus. One of the most technical tracks and one of the first written. A power ballad with strong melody and a clear section construction. The a big solo part with Rob Balducci and a trade off too. Ambient music made with guitar. There's a Left/Right sad harmony with a center chordal-tapped melody. Also i've added an electric ukulele to increase tension and leading from dark to light. The title track. A suite type of song with the big chorus already found in the overture: it was 5/4, now turns into 4/4. The climax solo is my vision of fast lines following harmony and the last chord theme was the really first thing ever written for the album. This tells a story, so there's no "fixed" structure. It describes the journey of water to the sea: sometimes calm, sometimes wavy, rippling and dropping into a waterfall then literally merging into the sea…and I think that moments are absolutely clear. 80's riffage and effects into a song that i personally love. The nervous melodies are well tempered into the choruses, trying to describe the nature's four elements. fast driving metal song with a great solo battle with Gianluca Ferro and unison bass lines. Life in the fast lane! The more intricate progressive song on the plot, with a cool drum solo made by Sergio Pescara. I wanna feel the vibe of a power trio playing rhythmically tied together. My trusty Peavey EVH Wolfgangs are all the way trough the record. I've used my old Ibanez "frankenstein" in some parts, a USA EVH Wolfgang which is an incredible instrument and a '57 reissue Fender Strat. Amps are a 1992 Marshall 6100 anniversary and a Soldano SP77 preamp for the more beefy and crunchy tones. Pedal are MXR flanger, phaser and chorus direct in front of the amp no loop, just plugged when used. There's also an original MXR 6 banq Eq for some sounds, but no distortion pedals: it's just amp. Delay appears in a wet/dry/wet situation or post effects as plugins. The real machines are a goofy old Korg SDD2000 and an Alesis Midiverb running stereo. Plugin is an incredible Echoboy and Eventide H4000 ultra harmonizer is the special effects cake (for example the coda in "Way to the sun"). Eveything is double tracked and analog mic'ed. Two years, from 1st august 2015 (as FB reminds me) to the end of august 2017, then mix and master took they part in September 2017. Actually I worked the bigger portion of my guitar work during the summers across the period. At the beginning I had two demo songs and a bunch of riffs I was working on. After some people tried to spin my work in a different way, suggesting me to make an EP, talking about rules and so on, I took consciousness of a whole album I could do with my own ideas, passion and devotion to the music, just for myself without compromises (that’s what the motto in the cd means). I said to myself: if I had to fail or do a good job, it will be doing my full mind’s view and so the writing began. What was your goal with making this album? Making real songs. I just get bored on nowadays guitar oriented instrumental records, because the majority sound as a backing track with a lead guitar or “forced” fusion. I wanted to make rhythm parts and harmonies that stands even without the lead part and that’s why you can hear intricate rhythm grooves or parts that make a call & reponse with the center guitar, exactly as a voice would do. There are for sure “Satrianesque” type of melodies but the song structure isn’t repetitive at all. You can easily listening to the album even if you are not a guitar player so, songs come first. Second, every instrument must have its own voice and role. You can find Hammond, bass and drum solos as a live band would do. Last but not least, making a record that could be listened on a road trip by car, alone or with friends with different feelings and moods. In what way do you think your album is different from all the other instrumental releases by guitarists being released these days? There's too much sense of "showing" something -which is just the result of fast playing- in today guitar playing. Someone could say that same was years ago, but with Youtube and Instagram stories, everyone make just the attempt on focusing attention for 30 seconds per day, than the next day there's another lick, another video, another routine. I think as said, that I've been much more in to the song writing than in a "guitar extravaganza" leading nowhere and many people listening to the album said exactly that concept. 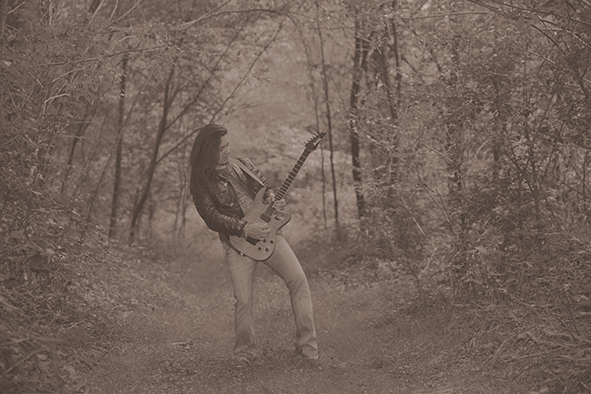 It's easy to listen to my songs even if you're not a guitar player, but I've tried to satisfy also shred fans and getting my ya-ya's out. the difference could be looking for the goal note and trying to be melodic also when you're riding a rollercoaster scalar run. I think I've done my best in this direction! What has the different musicians contributed to the result? Different musicians makes different approaches. I’ve chosen people who have already played in my musical life and virtually creating song bands. In the demo I’ve written all the drums with EZ drummer and simple bass lines. When it was time for recording real drums for example, I was able to speak with drummers in terms of rhythmic subdivisions and explaining what I need and where, letting them free to perform their own fills, but with my initial idea doubling the guitar. The result is pure musicianship, because everyone was absorbed by the song and have just to carry his own approach for letting the music live. I just wanted that everyone could express itself and sometimes we changed some hi-hat or double bass groove with Corrado and Sergio. Bass lines are more personal because done after the final drums. For example I asked Alberto to do a solo and said to Nicola to following my guide notes, but just to feel free interpreting the song: the result was superb with his bass running my sextuplets! Nonetheless my friend Alessandro Del Vecchio made a magnificent solo over a section and Rob Balducci and Gianluca Ferro were my logical choice for guest guitar solos. Rob is extremely melodic and I need a different solo for a call & response. With Gianluca (which is a long time friend) we made a sort of guitar tournaments with solos following each other. Every musician bring the sensation of a band playing together and not a sterile record, that’s how they contribute. Where do you see yourself in 5-10 years? What are your future plans? Who knows? Sure i'll never stop playing a guitar, just because i love the feel and the sound of an electric guitar. If ten years ago someone told me i would have written this album i wouldn't believe, so let's keeping dream. Will you tour to promote your new album? No, I don't think it's possible, expecially in Italy. I use to make tours with my old band when the word tour wasn't abused by cover bands and guys who pay for playing three shows in a row. I'll love the possibility to play a little role in a guitar show, but I don't know if there's enough room for outsiders. Do you think that music will survive the current "everything for free" mentality and do you think that people in general care? I think even the musicians seems not interested in new issues, not to mention debut albums! Since some journalist and nowadays magazines aren't making the researchibg work nomore, i can't understand how to discover new music that way, so i thank you again for your interest. Probably the Spotify algorithm is the new key to discover and follow artists with the same vein, but a well produced album costs more than people think. No one seems interested in supporting a local scene and few people buy cds or even legally download music. I'm a dinosaur? Probably! But I remember myself waiting weeks for albums delivered at the local music store, reading reviews, collecting posters, listening to the music, looking at artworks. The magic is gone, but I've a strong hope that something will change. All songs composed & arranged by Alessio Berlaffa, guitars recorded 111 studio by Alessio and engineered at Blue Velvet studio by Andrea “Bernie” De Bernardi, assisted by Michele Giacomello. Erik Tulissio recorded at Monodica studio Udine. Bass guitars engineered by Alessio Berlaffa at 111 studio. Alessandro Del Vecchio recorded at Ivory tears studio Somma Lombardo. Rob Balducci recorded at Blue Buddha studio in NY. 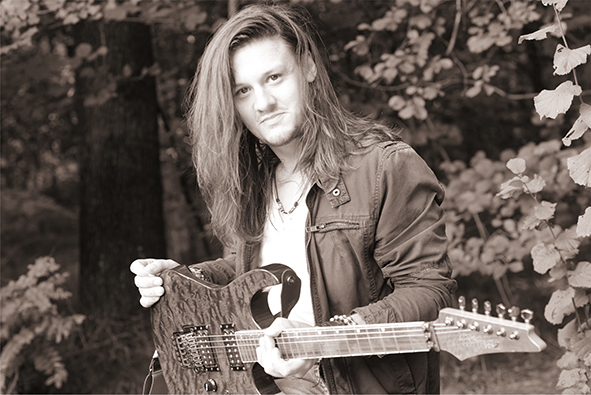 Gianluca Ferro recorded at the Hidden studio Legnano. Additional programming & virtual instruments Andrea “Bernie” De Bernardi. Mixed & mastered at eleven mastering studio by Andrea “Bernie” De Bernardi. Bass: Alberto Bollati, Gianni Cicogna, Nicola Angileri, Franco Avalli, Thomas plebani. Drums: Corrado Ciceri, Erik Tulissio, Sergio Pescara. Guest: Gianluca Ferro, Rob Balducci. 11 musician (but me) as 11 are the tracks. I’ve made all guitars, keys, synths and…ukulele!